The novel GRAVITY instrument, combining the light of all four telescopes of the ESO VLT for a 'super-telescope' of 130m diameter, has allowed dramatic progress in testing the paradigm that a super-massive black hole resides at the centre of our Milky Way (and most other massive galaxies). 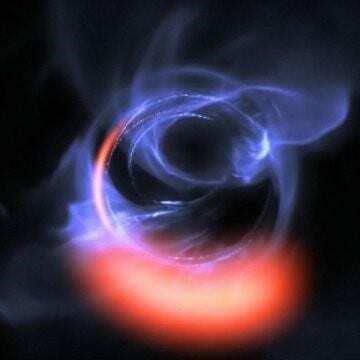 The observations show clumps of gas swirling around at about 30 per cent of the speed of light on a circular orbit just outside the innermost stable orbit of a four million mass black hole. In the paper "Detection of Orbital Motions Near the Last Stable Circular Orbit of the Massive Black Hole SgrA*" published on 31 October 2018 in the journal Astronomy & Astrophysics, scientists at the Max Planck Institute for Extraterrestrial Physics (MPE), Observatories of Paris and Grenoble, University of Cologne, Max Planck Institute for Astronomy, and Universities of Lisbon and Porto working with ESO's GRAVITY-VLTI reported the observation of flares of infrared radiation coming from the accretion disk of Sagittarius A*, a belt of gas with about 10 light-minutes in diameter orbiting at relativistic speeds (the speeds are about 30% of the speed of light). Working with ESO's GRAVITY-VLTI, scientists of the GRAVITY consortium including collaborators at the Max Planck Institute for Extraterrestrial Physics (MPE) and at the Physics Institute I at the University of Cologne, reported the observation of bright flares of infrared radiation coming from the accretion disk of Sagittarius A*, a belt of gas orbiting at relativistic speeds. While some matter can orbit the black hole safely, anything that gets too close is doomed to be pulled beyond the event horizon. The observed flares originated from material orbiting very close to the event horizon of Sagittarius A* itself. During these measurements, the 'GRAVITY team' also caught strong infrared emission in three prominent bright flares from very energetic electrons much closer to the black hole. This emission is thought to be coming from compact 'magnetic thunderstorms' in the very hot gas orbiting around Sagittarius A*, in analogy to the radiation bursts of solar flares. The motion of the three flares observed in the galactic centre can be explained by a simple orbit model with a radius of seven to ten times the event horizon. Thus, these observations confirmed exactly the theoretical predictions for such hot spots orbiting at the innermost edge of stable orbits around a black hole with a mass of four million solar masses.